Below are some of the services that Pacesetters provides. 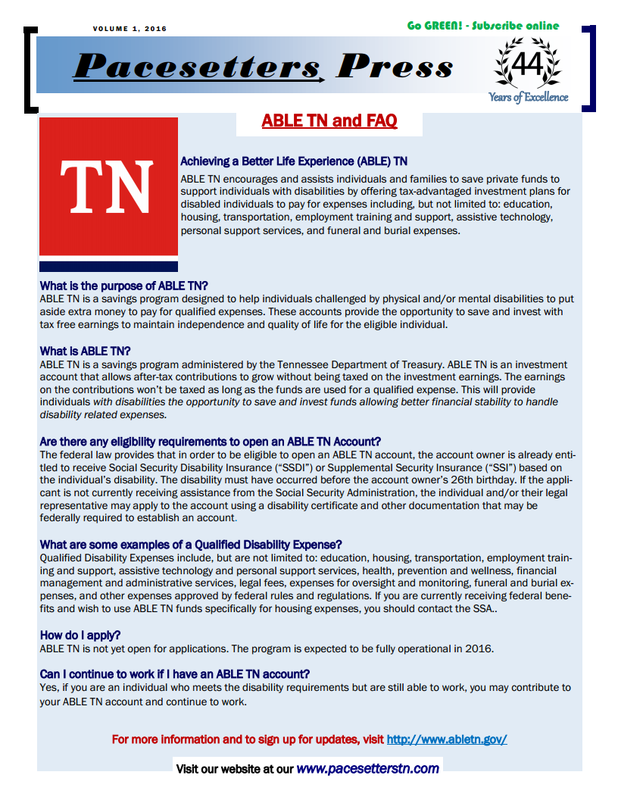 In 1992, at the urging of disability advocates and families, The Tennessee legislature established the Family Support Program. The program is funded by state dollars and designed to assist individuals with severe disabilities and their families to remain together in their homes and communities. Statewide funding for this program is determined by our state legislatures on a yearly basis from state tax dollars. The program is administered under an agreement with the state of Tennessee and managed by local agencies throughout the state. Pacesetters Inc-Family Support Program serves twelve counties in the Upper Cumberland area: Cannon, Clay, Cumberland, Fentress, Jackson, Macon, Overton, Pickett, Putnam, Van Buren, Warren, and White. Family Support is designed to provide financial assistance and community resource information to individuals with severe or developmental disabilities and their families. Services can include but are not limited to: Respite care, day care services, home modifications, equipment, supplies, personal assistance, transportation, homemaker services, housing costs, health-related needs, nursing and counseling. Services are flexible and responsive to families and their needs. Family Support is not a substitute for more comprehensive services provided under other programs, including the Medicaid HCBS Waiver, TennCare, Medicare, or private insurance. To contact our Family Support Staff. Pacesetters’ supports approximately 109 people in some type of residential supports in 5 counties (Putnam, Overton, White, Warren, Macon). There are 52 sites agency wide. Services are provided in Residential Habilitation (agency owned homes with 2-3 people); Supported Living (consumer homes/apartments with 1-3 people); Semi-Independent Living (individual homes/apartments with intermittent supports); Family Model (non-family homes with continuous supports for 1-2 people); and Respite (relief services in family or agency homes – typically for people already receiving our day supports). Supports include up to 24 hour staff supervision, with assistance as needed for activities of daily living, budgeting, maintaining a home, and enabling the person to live in a home in the community. Supported Employment services are offered to individuals in Putnam, White, Warren, Overton and Macon counties. Through assessments, and participation in the local job clubs, individuals are evaluated to determine interests and abilities related to work. In addition, opportunities exist to work on mobile work crews established through several State Use cleaning contracts. Referrals for individual placements are also made to the Dept. Of Rehabilitation Services and a V.R. case is opened. When the individual completes the V.R. process they are then eligible for Supported Employment from “DIDS”. Supported Employment at this level can be Follow Along, Individual, Group or Special Needs, depending on the skill and needs of each individual. No matter what the need, Pacesetters, Inc. has trained, and qualified, staff to help each individual find their place in the community job market.